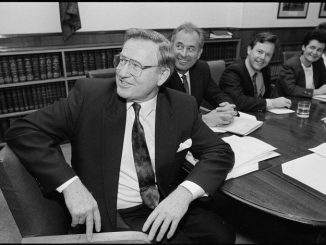 The neo-liberal wing of the National Party has never really felt that Jim Bolger was one of them, and the feeling was entirely mutual. Back in October 1980 when the ideologues wanted Bolger to topple Robert Muldoon (in the so called ‘colonels coup’) he declined to be their agent, on the grounds that he thought the cure they were offering would be worse than the disease. Tactically, Bolger then outflanked the neo-liberals (ie Quigley, Upton, Richardson) by bringing in voluntary unionism in 1983. No love lost then. Those ancient battles are only one reason behind National’s kneejerk criticism of Bolger’s appointment to head the government task force on labour reform. Unfortunately, National and some of its more reactionary business mates are the ones seemingly intent on living in the past. (How depressing it must be for the Chris Bishops of the National caucus, to have to listen to their senior colleagues still clinging to the market nostrums of yesteryear.) Newsflash for National: it isn’t the early 1990s anymore. The days when the likes of Scott Simpson can get by with cheap cracks about Bolger ‘taking us back to the 1970s’ are over. As Bolger said on RNZ this morning, the genuine problems facing the country’s employers and workers can’t be solved by resorting to slogans, or to the past. Both major parties, he pointed out, have worked together on the mycoplasma bovis crisis, and a similar level of concerted effort will be needed, he suggested, to meet the labour market challenges confronting New Zealand. Mainly because the status quo simply isn’t cutting it. The agenda for Bolger’s working group is relatively modest. The 10 person working group of business and union leaders and academics is being asked to investigate collective agreements, and minimum pay and conditions across industries. The working group will look at ways to implement what are being called Fair Pay Agreements, between unions and employers. Despite the scare mongering from National that these modest endeavours will take us back to the strikes of the 1970s, both strikes and lockouts will actually be forbidden during the period when FPAs are being negotiated. And if the likes of the Employers and Manufacturers Association (EMA) can’t seem to get their heads around a notion like “ fair” pay – then they can be taken by the hand and told in soothing tones that it really won’t be all that different from notions like “ good faith” bargaining that haven’t been all that very hard to grasp. As the PSA has already pointed out, last year’s $2 billion care and support settlement was, in many ways, a Fair Pay Agreement – and it has enjoyed huge public support. On the basis of the empirical evidence it is very difficult to reach, in a systematic way, any strong conclusions about the beneficial economic effects of the Employment Contracts Act. In particular the poor productivity growth rules out the likelihood that the ECA was a major contributor to the macroeconomic expansion of the mid 1990s. The Act would, however, seem to have contributed to the poor real wage growth and the failure of many workers to obtain a share in any increase in the prosperity of the 1990s. New Zealand’s economic policy between 1984 and 1996 is often hailed as an example of comprehensive supply-side reform that successfully improved the performance of a weak economy. In contrast, this paper presents statistical evidence to show that: (1) New Zealand sacrificed a large volume of real per capita gross domestic product after 1987; (2) its average unemployment rate increased substantially after 1988; (3) labour productivity growth declined after 1992; and (4) the per capita real income of low-income households in 1996 was more than 3% lower in absolute terms than it had been in 1984. All that Bolger’s team are likely to come up with are some minimum floors below which no modern economy can realistically hope to thrive. Conceptually, this is little different to the minimum wage, which almost all employers have managed to observe, while still turning a profit. As the PSA says, we’ve also begun to tackle the gender wage gaps at a systemic level, without the sky falling in. Bolger can see the need for change. If the EMA can’t see it, there is hope that some of its brighter, more progressive members can, and will. What with Jim Bolger and Michael Cullen being called in as review team leader on so many occasions, Parliament can seem like that hotel that you can check out of, but which you can never leave. A bit like a ghost town, as Kanye West says on this track from his dismal 24 minute long new album, Ye.